Crossing over to the Dark Side… with Paint! OMG! YAY is right. 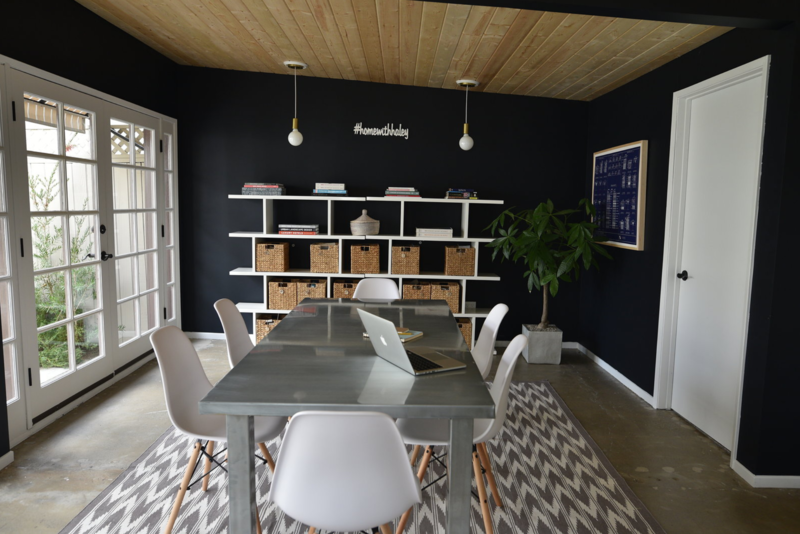 When my good friend Haley Weidenbaum told me she had been craving an office update, I knew we should join forces. Haley, an amazing interior designer based in LA, was thinking of going over the dark side for a while. And yes, we are talking about paint! When I mentioned how fun and easy it would be to combine efforts, she was all in. We tapped my go-to resource Ace Hardware, who not only has so many amazing brands and colors of paint to choose from, but they also have the “Extra Mile Promise”, which makes paint projects like this seamless. The Extra Mile Promise means that when you visit The Paint Studio at Ace, your helpful associate will run through a complete checklist of everything you’ll need for your paint project to ensure you leave the store feeling confident you’ll have everything you need! If you realize you forgot something after your gallon of paint and paint materials purchase – Ace will actually help you order anything you forgot over the phone and deliver the products to your home and the delivery is FREE! Let’s get something out of the way. 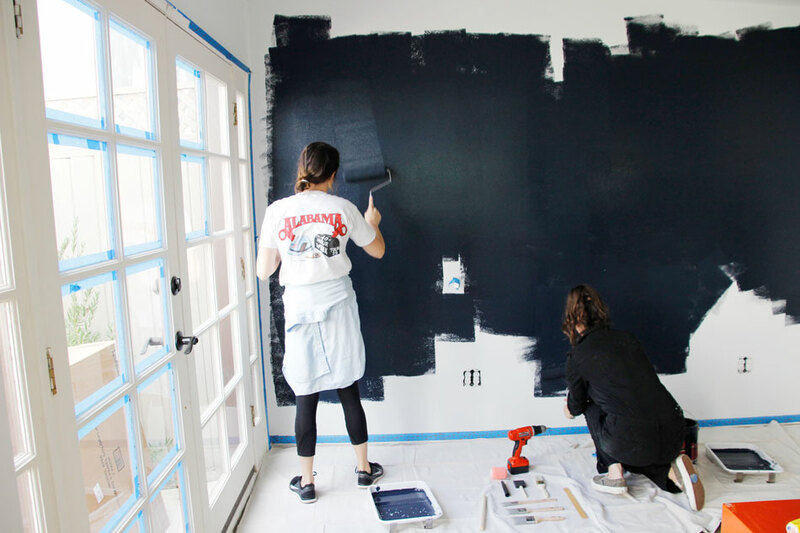 Yes, painting can be overwhelming, but it can also be really fun to do with a partner in crime. Even though Haley spends her days designing other people’s homes, she hasn’t worked too much with paint herself. However, she was down for a little DIY and was ready to roll up her sleeves, and down to roll some paint. As you can see from her before pictures, the space was simply decorated. It was lacking a real sense of design and overall color palate. 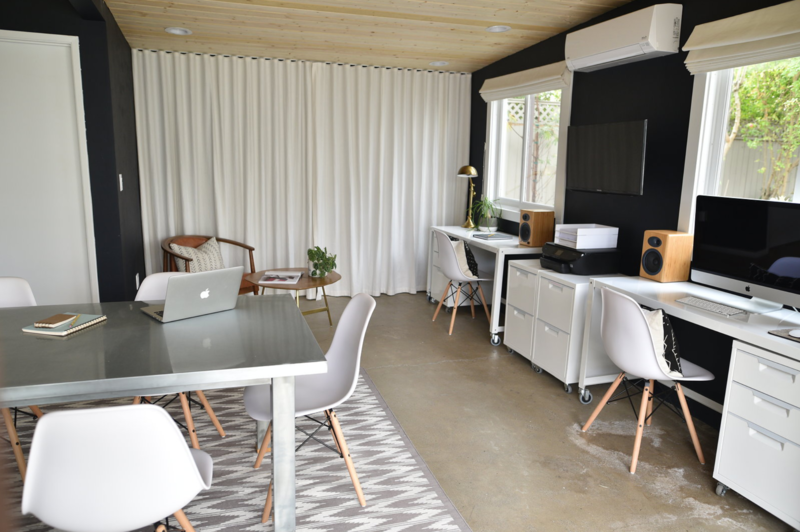 Her office is about 550 sq feet, so it’s a pretty manageable size for a home DIY. Knowing your square footage is very helpful when doing the calculations for the paint. 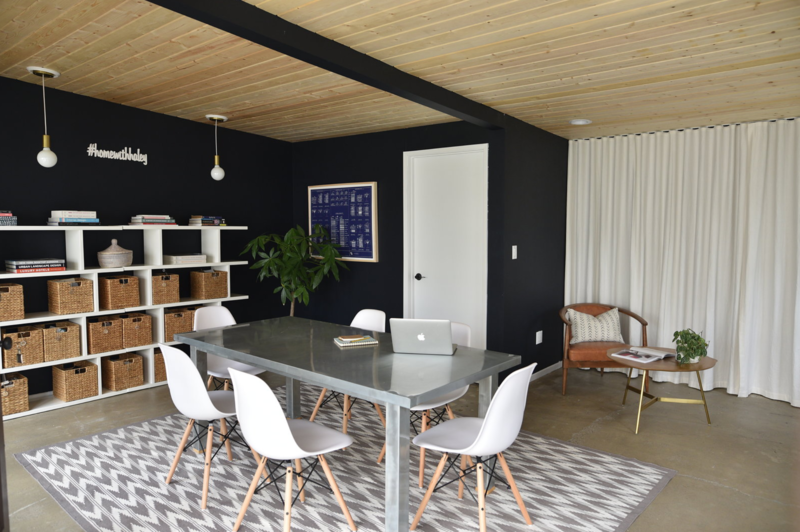 As long as you know your square footage, Ace’s Paint Studio can help with the rest! The paint hue from Clark+Kensington was bold choice. Literally. It’s called Black Sand (37A-5), and we got in a flat finish. 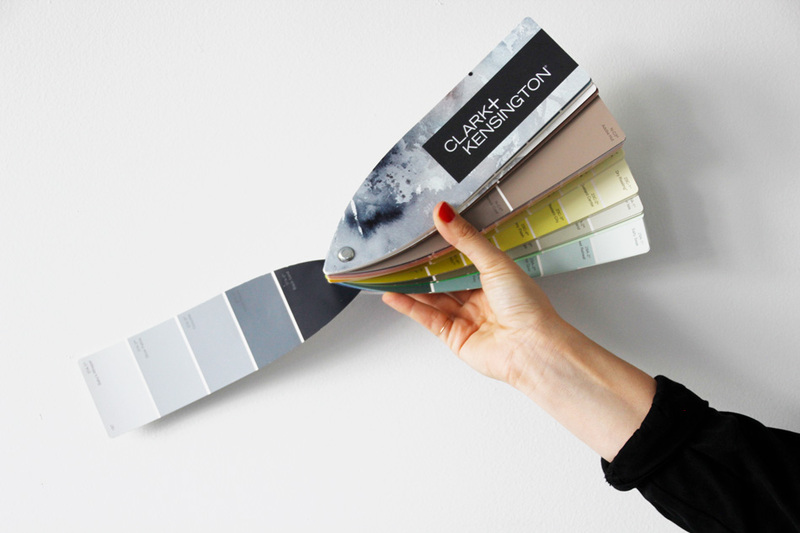 Just an FYI, Clark+Kensington is able to be color matched to your favorite fabric or inspiration piece in-store at your local Ace, which is amazing if you’re trying to achieve an exact color. 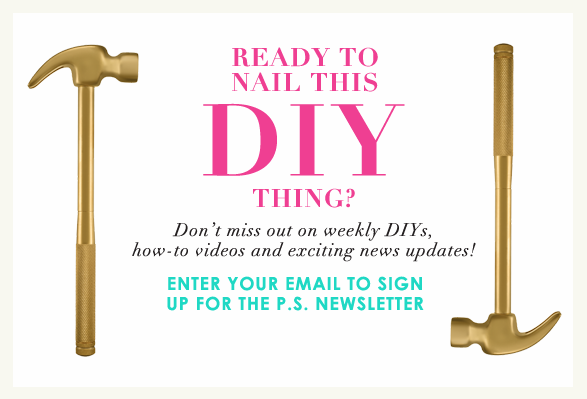 Aside from the paint, as for the other DIY supplies… all the usual suspects are here! Taping the walls is probably the most time consuming. The reason why we do this is to protect the trim from getting paint all over it, and it also helps create a clean straight line around the trim. 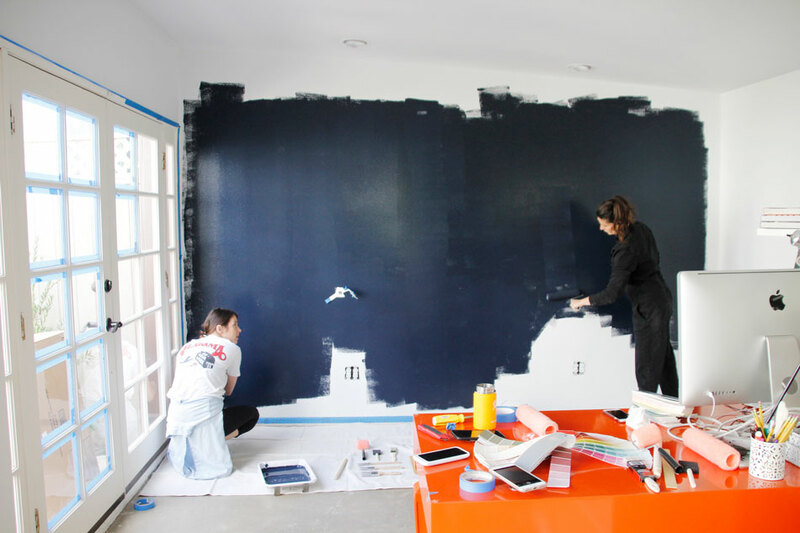 Using painter’s tape is ideal, as it will not harm your walls. And if you need to pull it up and place down again, it’s very easy to maneuver. Once that’s on there, it’s time to get to work! When you can do it together! After all, teamwork makes the dream work. The first coat should go on smooth and even. 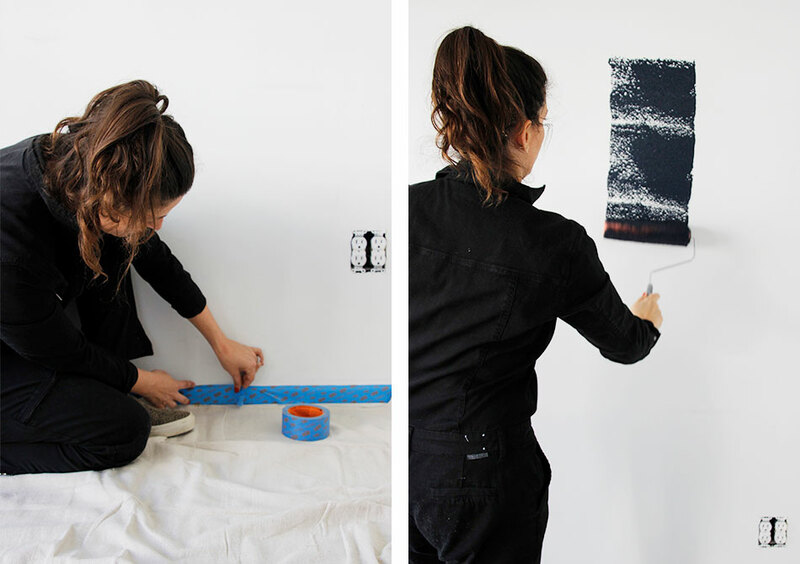 You don’t want drips or heavy splotches on your wall. Make sure to roll over any excess paint before actually taking it to the wall. 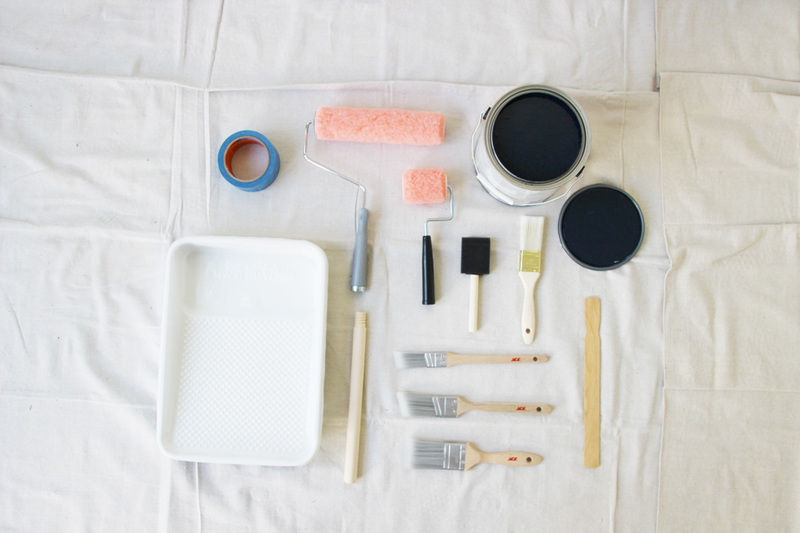 Most spaces require two coats of paint, so don’t worry if the color isn’t looking like you thought. Good things take time. Since Haley was adding shiplap (wood panels) to her ceiling, we didn’t need to worry about if it actually hit the ceiling, which was nice knowing that the wood would eventually cover it. 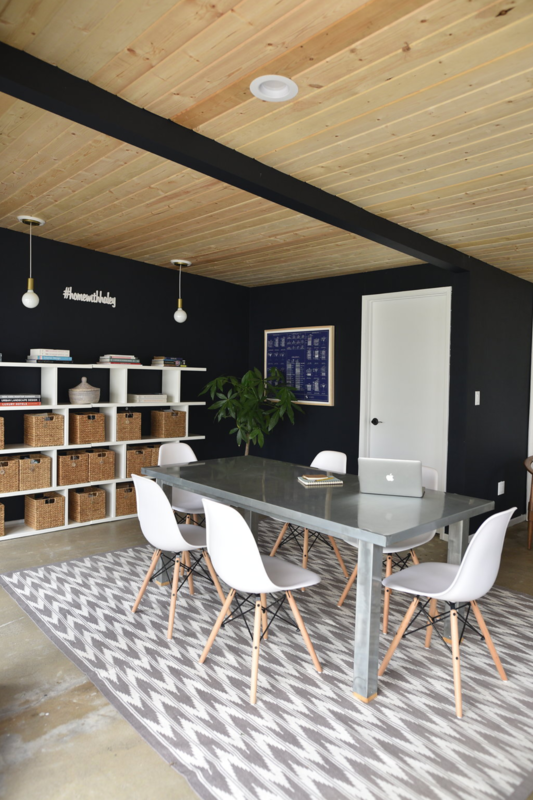 Two coats of paint, some new light fixtures, a natural wood Shliplap ceiling, and some other personal touches, and it’s a brand new office! 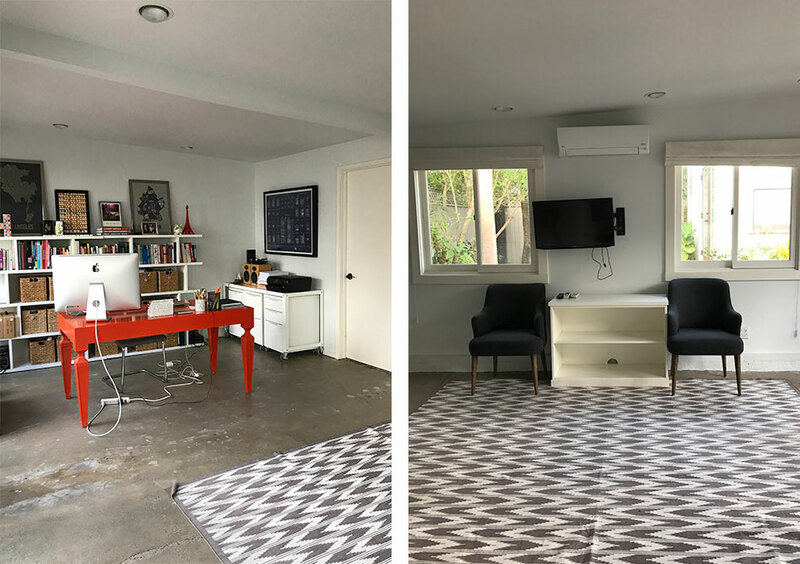 It’s really amazing what a new color of paint can do to a room. It can help sent an entire vibe and tone, just by changing a color, not matter what size the room may be. 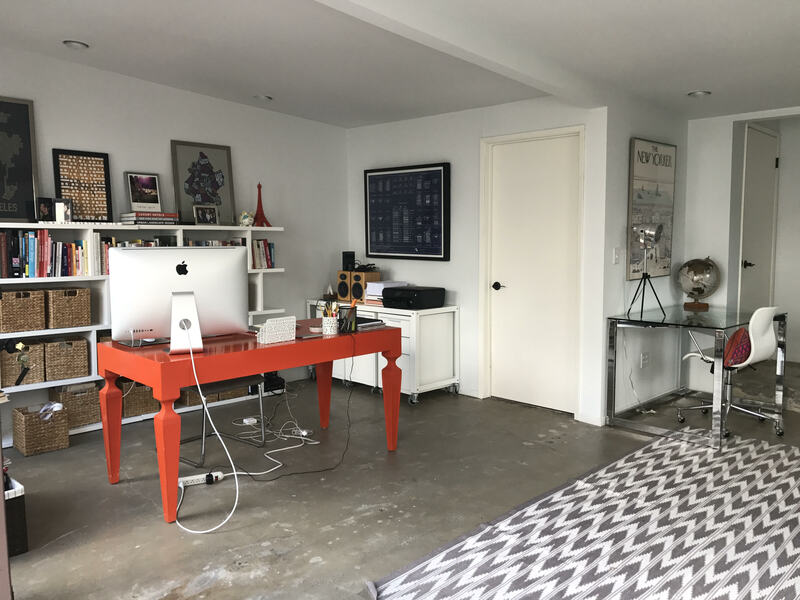 The space now feels more inviting and cozy, but yet sophisticated. 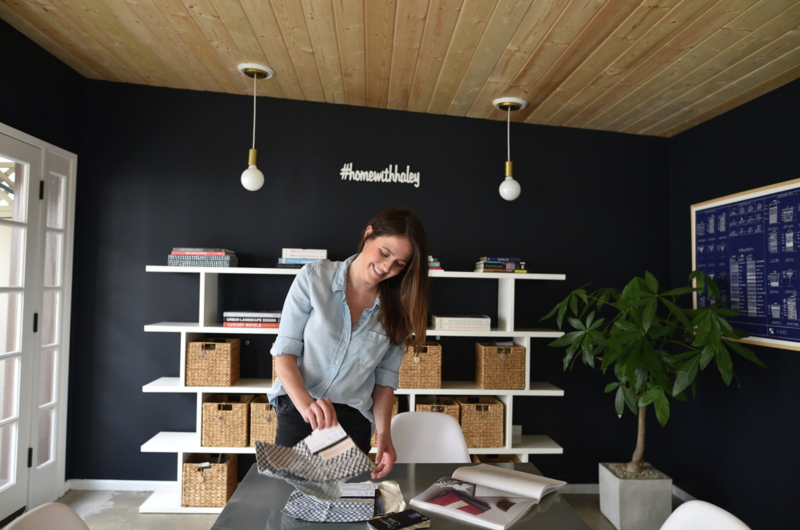 Never seen a #homewithaley that I didn’t love… but I especially love hers! P.S.- I think she does too.